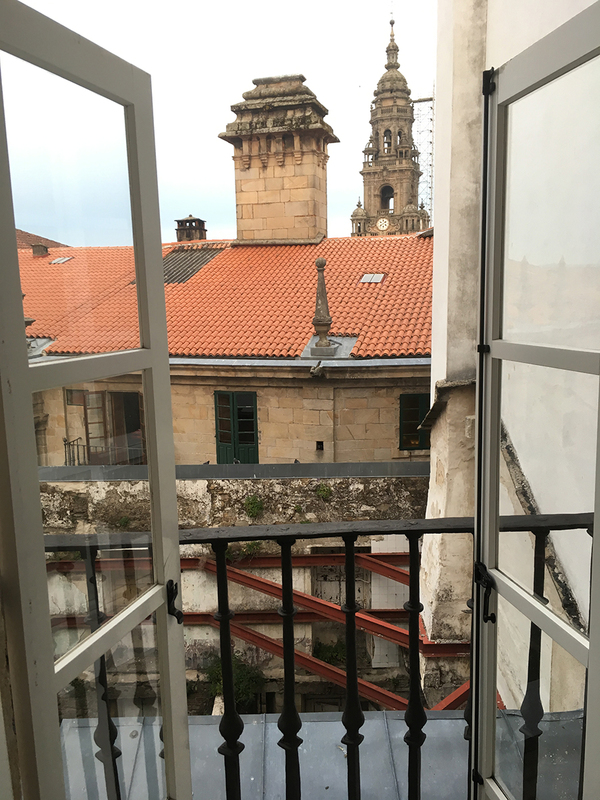 6/19/17 – 22.8km/14.2mi from Santiago de Compostela to Negreira. After 40 days and 40 nights of traveling through a certain desert, certain people reached a final destination. We… have a few more to go. Our “Camino family” has dwindled from 10 to 4, and only Serrina, Courtney, David, and I are left. 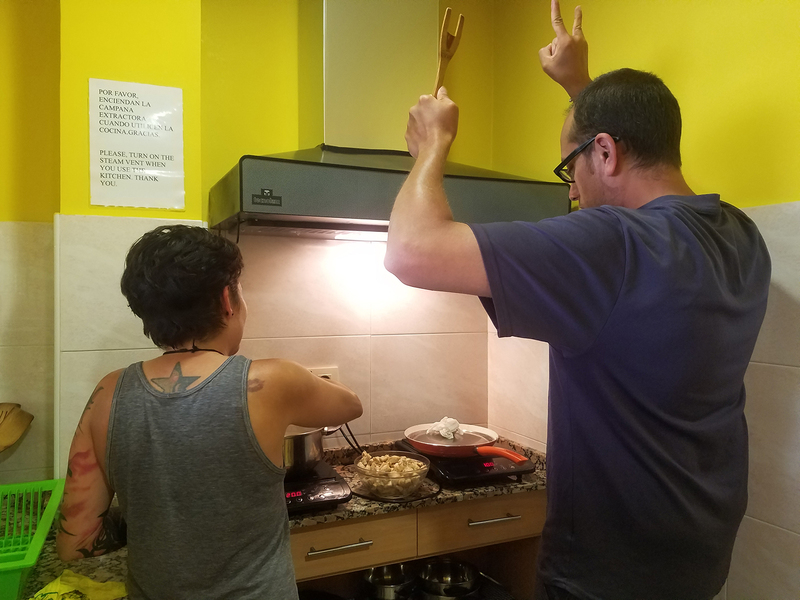 But we will continue on 3 days, to Finisterre – the “end of the world.” After that, one more day to Muxía, where the magic is. We left Santiago early in the morning after saying some sad goodbyes both the previous night and today. I’m surprised I didn’t remember more of today’s walk, considering I did the same route a few years ago. And, it was interesting to see new faces, and chat up some of them. 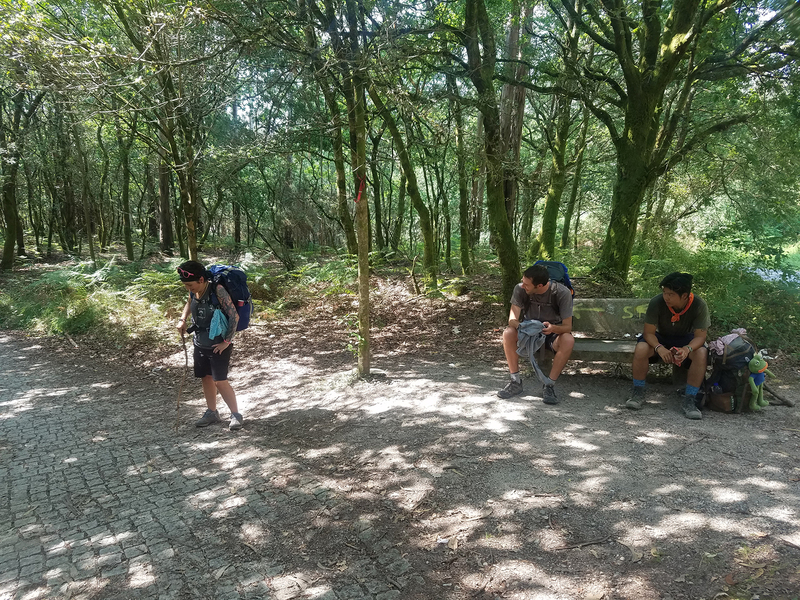 There was one big 250m/820ft climb, and we had to stop at a point where some guys were chopping down a tree with chainsaws, right in the middle of the path. 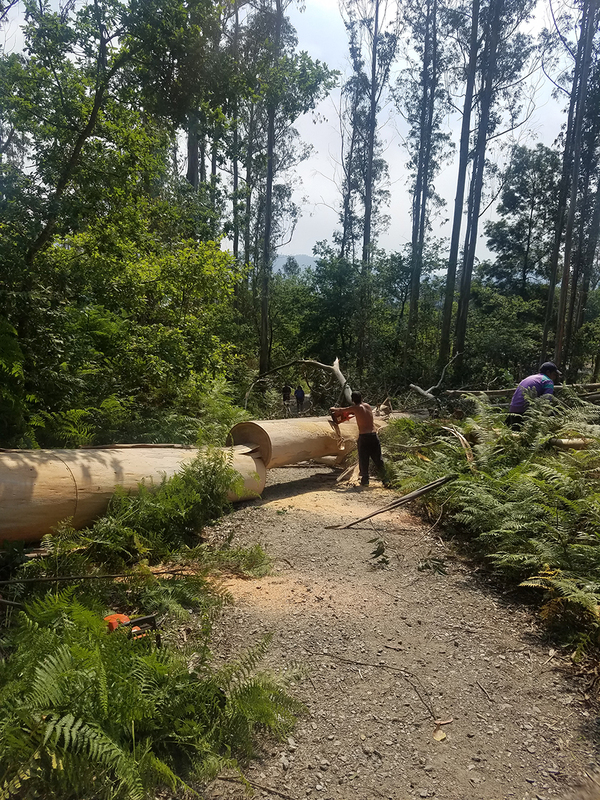 We couldn’t tell if it was “unauthorized logging,” or legit path clearing. 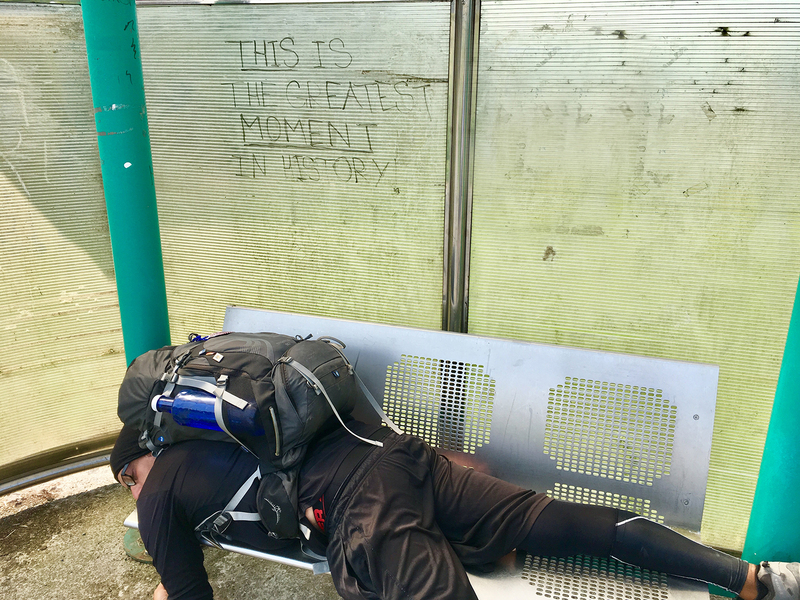 We came across a bus station that had written on it, “this is the greatest moment in history,” so naturally we had to take pictures. We met a remarkable lady, Birgitte, from Budapest – seven MONTHS ago, she began walking from Budapest. 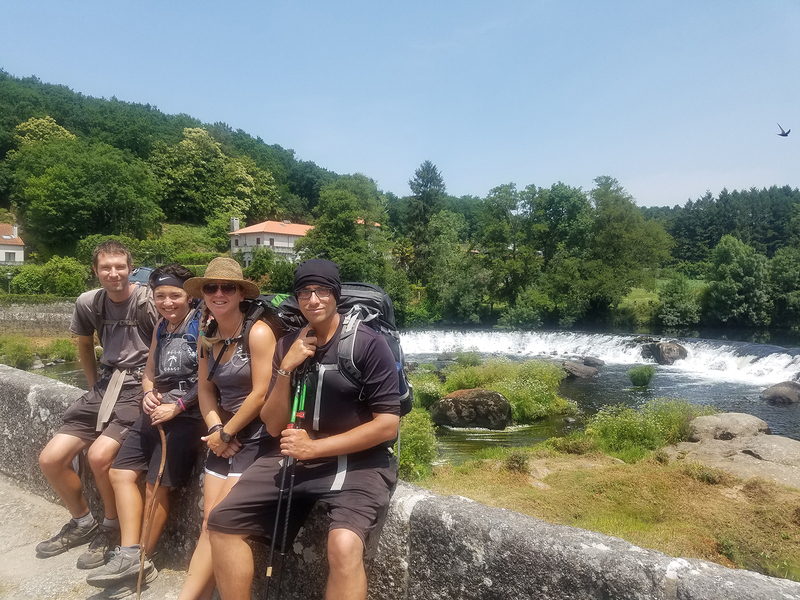 She reached Santiago and now heads to the “end of the world” with the rest of us. What a warrior! And finally, we stopped for a quick break at a restaurant by the Ponte Maceira. 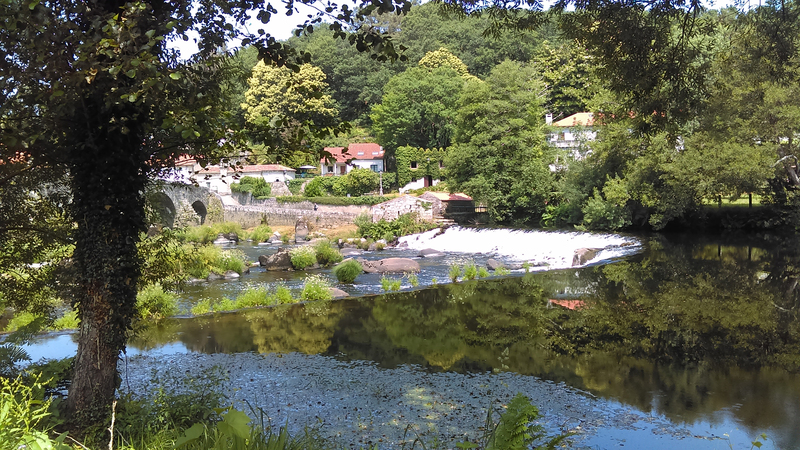 About this place, our guide app says, “for legal reasons, I cannot advise you to swim in the river here, but … you would not be alone.” And on a hot day like today, taking a dip in that cold river was one of the most refreshing feelings I’ve felt in a while. On a blazing hot day, somehow there is no cover from clouds or trees, or somehow the air is still when you really need a cool breeze. Oh, and when you do get that merciful cool breeze, it carries with it the smell of a freshly poop-sprayed field or a fertilizer warehouse. Smells on various forest paths have been really nice, but don’t get me wrong – there were dozens of miles where we were huffing and puffing up hills while inhaling the scent of fertilizer and poop fields. Or just ourselves – no amount of perfume can help that on these long hot days! Some days are cool but still somehow swelteringly humid so that on a climb, you sweat like mad, and then you freeze at the top because your clothes are drenched. On crisp cool days that are chilly but ok for hiking (once your body heat gets moving), you freeze the moment you stop because the sun goes away, or blustering winds always seem to hit at that exact moment. It’s pretty easy to sit at home and crank up the AC or the heat, but we often take for granted what modern marvels those two things are. But we peregrinos endure and walk on the next day. After these long days, you’d think we can sleep through anything. WRONG. 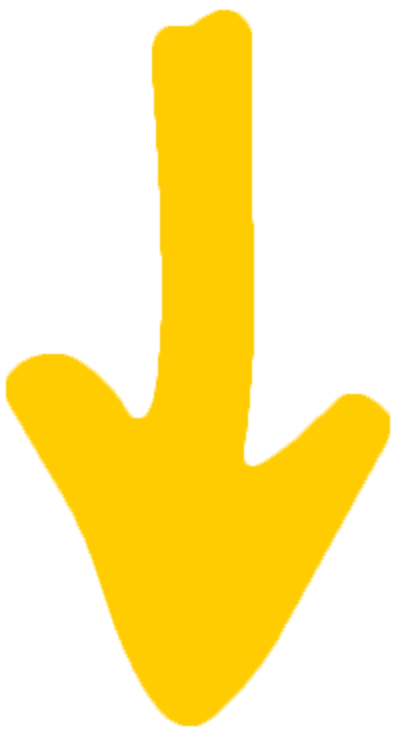 Imagine sleeping in a hiker hostel with 8 to 100 other people, and all the body heat and odor those people radiate, even if they’ve showered. Imagine cramped quarters with no air flow, so you just bake at night. And when windows help create a nice cross breeze, the mosquitoes come out to feast on us. And even if your hostel has comfortable beds, clean bathrooms, and AC, there is always that ONE Level 20 “snorelax” whose sound penetrates your earplugs like they’re made of paper. Or that church bell that rings every 15 minutes, ALL THROUGH THE NIGHT. No soundproof walls. No noise-canceling earphones. But we deal with it, get what sleep we can, and go on the next day. But all joking and serious complaining aside, there is one thing that makes peregrinos real warriors. 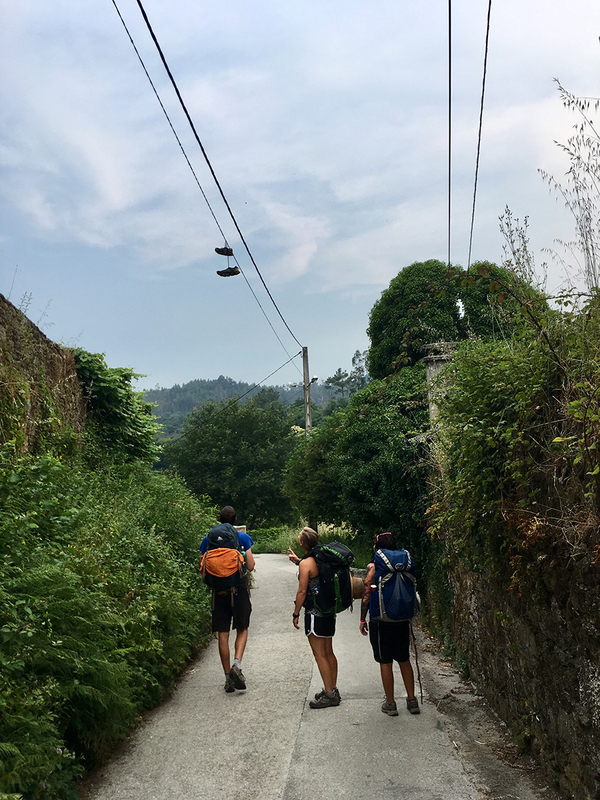 Whenever somebody on the Camino gets medical help for ankle, knee, hip, or foot problems, the doctors here usually say, “we advise that you don’t walk any further.” Well, that’s not what we came here for. The number of people I’ve seen walk hundreds of miles with blistered-out feet, blown out knees, sprains, strains, tendinitis, stress fractures, herniated discs, sunburn, chafing, and much more is remarkable. At home we can just rest, ice, and elevate – in the comfort of that heat or AC. Even marathoners get to bandage their wounds and get off their feet after their race ends. But ancient pilgrims soldiered on hundreds, often thousands of miles, and we do the best we can, every single day. “There’s always something!” But these challenges and discomforts make every day more rewarding; every climb that much more of an accomplishment; every beer that much more deserved; and every step a feat. There are few better ways to test yourself, and few more exhilarating feelings than knowing that you have the strength to fight through these trials. We are as strong as we want to be.